Thursday, November 24, through Monday, November 28. 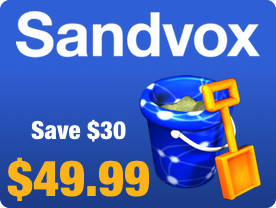 Use the coupon code THANKS at the Karelia Store for $30 off on Sandvox. Or purchase it on the Mac App Store on Cyber Monday, November 28, at the same special price — no coupon code needed! Use the code 51FTW at A2 Hosting for 51% off of any website hosting plan. This is a one-time discount for new customers only!